The “New” iPad Mute Switch | Pi'ikea St. Behold the switch that has caused many an iPad owner confusion and bewilderment. The deal with this switch is that with the latest iOS update from Apple, it has a different function than before. When the iPad was released this switch functioned as an orientation lock, so you can lay down with your iPad and not have the screen flip around on you. 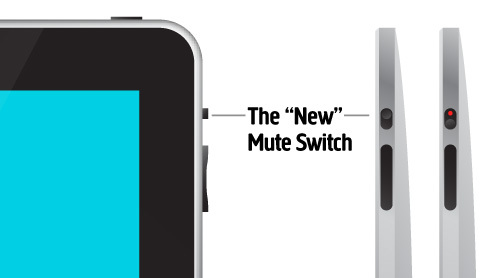 The latest software makes the iPad more like an iPhone and changes this switch to a mute button. Flip it to quickly mute all sound on the iPad. If you’re not sure what iOS you’re using, on your iPad go to the Settings App, touch the General tab and look for Version. So if you’re having issues with our app, Interactive Alphabet, or any other apps give this switch a couple flips and crank that volume up. This solves the vast majority of sound issues. Thank you so much! Now my grandson can enjoy yor App!